How can I keep track of my sources so I can list them in my MMD videos? How can I make my own read me files so I can give proper sourcess. How do I make a read me file? To make a new text document, just right-click on your Desktop. A little menu pops up and you choose NEW … Text Document. The file’s icon appears on your desktop, and you give it a name “credit.txt” Then you open that document and copy/paste the web page address or type yourself some notes about the download. You might get an error when you name your Text Document. My system is set up that way. When I rename a text document, I have to remember to include the .txt extension in my file name. After you have finished downloading your ZIP and you extract your new folders, drag and drop that text file into that new folder … it’s like making your own READ ME file. Giving credits for the properties you use is a big part of being a responsible MMDer. You’ll feel good knowing you can always give the proper sources. 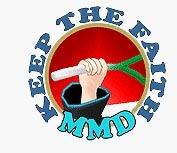 Read all about the need to list your sources and exactly “who owns what” in MMD and the rules for sharing MMD items at LearnMMD’s KEEP THE FAITH-MMD page. Thank you!